We need just one dependency here: scalatest – the other dependencies are needed for the JUnit and Selenium examples. libraryDependencies += "org.scalatest" %% "scalatest" % "2.0.M5" % "test"
libraryDependencies += "junit" % "junit" % "4.11" % "test"
libraryDependencies += "org.seleniumhq.selenium" % "selenium-java" % "2.25.0" % "test"
I have used Roy Osherove’s String Calculator Coding Kata here to write some tests in a test-driven manner. There are several matchers available to spice up your life and I am going to explain a short subset of the existing matchers here. A complete and detailed documentation for the matchers can be found in the ScalaTest documentation. Don’t forget to surround the expression with parantheses .. e.g. “users must have size(3) and contain key(3)” would be wrong. Sometimes one need to run the test files using JUnit because of a tools that depends on that framework (e.g. Infinitest) – luckily this can be done with ease. 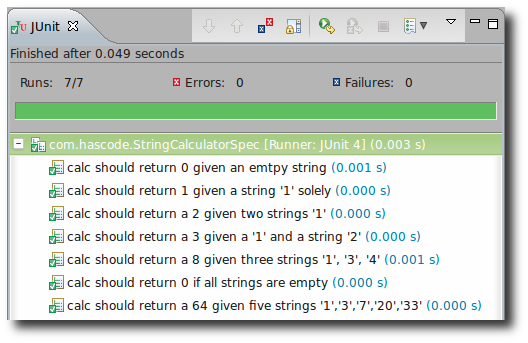 If you’re simply missing the well known JUnit view in Eclipse, please take a look at the Test Runner that comes with the Scala IDE for Eclipse first! Writing tests in the classical BDD style with given-when-then is easy and there is a nice trait, GivenWhenThen to support this syntax. If you need to test your web application, ScalaTest offers a nice integration of Selenium Webdriver here and allows you to write your acceptance tests in a short and concise way. Well-written and more detailed information can be found in the ScalaTest documentation. In the following examples, we’re testing my blog’s search and validate the result of the search afterwards. This entry was posted on Sunday, January 13th, 2013 at 5:24 pm	and is filed under Scala, testing. You can follow any responses to this entry through the RSS 2.0 feed. You can skip to the end and leave a response. Pinging is currently not allowed.